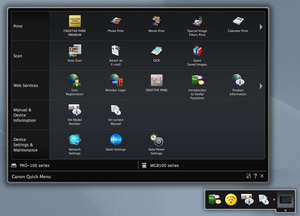 Canon Quick Menu is a small and handy tool for accessing the features, tools and documentation which come with Canon printers. The application also has a tool for organizing photos so than you may scan and print images that have been scanned with a Canon system. This additional tool called My Image Garden can be downloaded from within the Canon Quick Menu application itself. Installation of Canon Quick Menu is a breeze and afterward, you'll have access to the application from the system tray where you will be able to access the control panel. Version 2.8.5 is a freeware program which does not have restrictions and it's free so it doesn't cost anything. For security reasons, you should also check out the Canon Quick Menu download at LO4D.com which includes virus and malware tests. Additional screenshots of this application download may be available, too.